Do you have a question or are you looking for a special fabric? Do you need more information about a class or a product? E-mail Susan at gatheringfabric@aol.com and I will promply answer your questions. Thank you for the opportunity to serve you. Our mission is to support the culture of quilt making and textile arts by offering quality and selection of materials, excellent customers service, support and inspiration in a comfortable and convenient location. 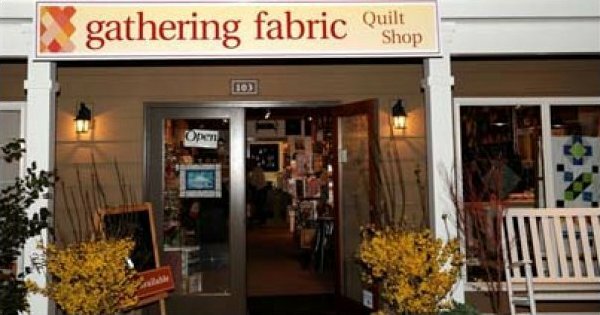 Thank you for visiting Gathering Fabric Quilt Shop. Want to be up to date on all our quilting activities, special promotions and classes? with special coupons to our Bee Mail customers only. Monday - Friday: 10AM - 5:00PM. Open late for Quilt Club, third Thursday. * A note to Saturday Shoppers, come early as wine tasting fills the parking lot around 2pm.